Another post I found in my drafts file…. I am still in the middle of rug camp season. Three more classes and one family vacation (my parents’ 50th wedding anniversary) and at the end of July I will be on my own for a while. In the meantime, I had a tiny bit of downtime this week so I worked some more on the circle border. I reread my January 7 post where I first introduced the circle border. Why did I say that I ruled out an all black background? Hmmmm…..
Several students have expressed interest in hooking this type of design and have asked me to explain how I am hooking this border. So here goes…. 1. Set up the space to be filled by hooking a line of background down both sides. My lines are purposely NOT straight. I’ll leave that explanation for another post. 2. Hook the first circle. I am not making them perfect circles on purpose, so no pattern, no template. I force the circle to touch one of background lines. I had already decided that there will be roughly two columns of circles. 3. Once the circle outline is hooked, I hook a partial second row inside the circle with the same color. I want the circles to look lopsided. 4. Next I fill in with another color, with either a single row or another lopsided double row, depending on the size of the circle. Be sure to move the doubled up areas around. 5. Fill the remaining area with a third and final color. The size of my circles and the cut size determines how many colors I can use. 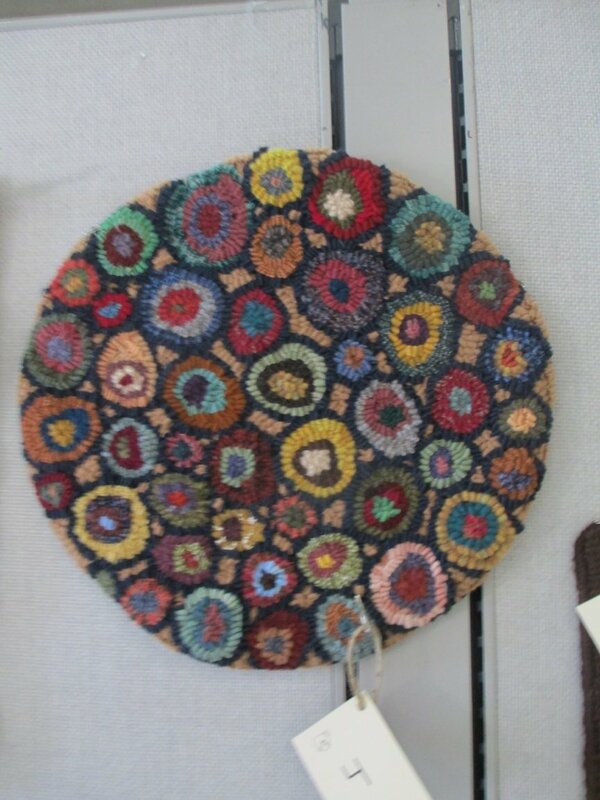 I like the busyness of smaller circles and it keeps my color decisions easy. 6. Hook one row of the background color around the part of the circle that does not touch the row of background. 7. Hook the next circle so that it touches the row of background and one or more of the existing circles. Be sure to make it a different size. Fill it in as I did the first one. 8. Hook a row of background. I find this method easier than drawing the circles in advance. When you draw them it is almost impossible to get them so that they are exactly one strip of background away from the next. I think this is what holds the design together – the consistent size of the surrounding background. One of my studio students, Pat, brought her granddaughter and a friend to me for hooking instruction. The girls picked it up in no time flat. Both are only Juniors in high school but they looked like they had been hooking forever. They started out with a small square piece that I have most beginners start on. Their project were finished before their visit with grandma ended. They went home with a completely finished and bound piece — and a new project to work on. Pat’s motivation for their lesson was insurance. She is beginning a large rug filled with these circles. With a large piece of backing and beginning in the center, she is hooking the circles. She even had the girls hook a few before they left. She figures that if she is not around to finish this rug, the girls are prepared to finish what they started. Update: The rug was finished in record time. It is beautiful! One of my favorites. The strips of paper point out the two circles that the young girls hooked. Hooked by Gayle Burton. Thanks for sharing the photo, Gayle. But it is turning out to be very enjoyable! Gayle shared this image with me and I decided to post it here for everyone to enjoy. Hi Cindy – After reading your instructions on how you made the cats paw circles on your big rug border, I wanted to give it a try myself. I drew a 15″ circle and got busy. What a fun project! Thanks for sharing your talents!